Choose from 6 hotels and guest houses in Moray. Shown below a just a selection of the hotels available. To search within an area please use the menu on the right. Cluny Bank Hotel - Nestling in the bank of Cluny Hill, this small, family-run Victorian hotel offers award-winning food and overlooks the beautiful village of Forres, between Aberdeen and Inverness. Built in 1865 and extended in 1910, Cluny Bank is a listed building at Historic Scotland. Carefully maintained, it was a private home for many years and was only recently converted into a hotel. Today the hotel offers a unique blend of modern amenities and many of its fine original features. Forres is located on the A96, within easy reach of both the Whisky and Castle trail. As the Forres Golf Course is just around the corner, Cluny Bank Hotel is also ideally situated for golfers. Craigellachie Hotel of Speyside - Situated in the beautiful village of Craigellachie, this hotel offers an idyllic setting in which to savour the style and elegance of a bygone era. Built in 1893, this country house hotel sits at the confluence of the Fiddich and Spey rivers. Craigellachie Hotel offers modern day comforts and facilities whilst capturing the charm of yesteryear. The famous Spey Walk runs by the hotel, providing majestic, uninterrupted views over forest, river and mountain. Its quiet setting makes the Craigellachie Hotel ideal for successful conferences. Take advantage of the extensive conference facilities, attentive staff, spacious, naturally lit meeting rooms, catering and the opportunity to unwind after business in the Quaich bar. Stotfield Hotel - Against the stunning seaside backdrop of Lossiemouth in the Scottish Highlands, this Victorian hotel provides beautiful views over the Moray Firth, a 5 minute walk from unspoilt sandy beaches. A hotel since its construction in 1895, Stotfield is among the oldest hotels in Morayshire. Comprised of 46 en suite bedrooms, each is equipped with a selection of facilities. A restaurant, bar and sauna are all also on hand to keep you relaxed and entertained. Explore the excellent local scenery, or simply pop across the road to the Moray Golf Club, which boasts 2 courses, one of which is used in championships. Business travellers can make use of 3 conference rooms, which are also available for functions of up to 150 guests. Premier Inn Elgin - Just outside the centre of Elgin, this Premier Inn hotel has free parking, family-friendly en suite rooms and an on-site Brewers Fayre restaurant. 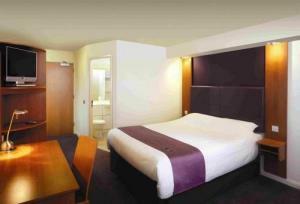 Some rooms at the Premier Inn Elgin can take 2 adults and up to 2 children (under 16 years). The 2 children also get a free full breakfast when accompanied by an adult eating a full breakfast. The full all-you-can-eat breakfast has the expected cooked items, including vegetarian sausages, as well as a wide continental selection. The Dowans Hotel - Set high above the village of Charlestown of Aberlour and overlooking the River Spey, this elegant country hotel is an ideal venue for shooting and fishing, and for whisky-lovers. The Dowans Hotel was built over 100 years ago and offers the chance for a relaxing break. All rooms are en suite and have excellent views over the beautiful gardens. Rooms at the front of the house have excellent views over River Spey and the surrounding woodland. The hotel is well located for salmon fishing, shooting and visiting the golf courses of Moray and Speyside. The Speyside region is also home to several whiskey distilleries, and many are close to the hotel. Crerar Eight Acres Hotel - This refurbished hotel in 8-acre grounds has a leisure club, an indoor pool and comfy accommodation. A bar, restaurant, squash courts and 5 conference rooms are on site. Crerar Eight Acres Hotel is situated on the world-famous malt whisky trail. It is close to the town centre and local amenities, and Baxters of Speyside, Johnstons Cashmere Centre and fine golf courses are close by. The hotel is one mile from Elgin.